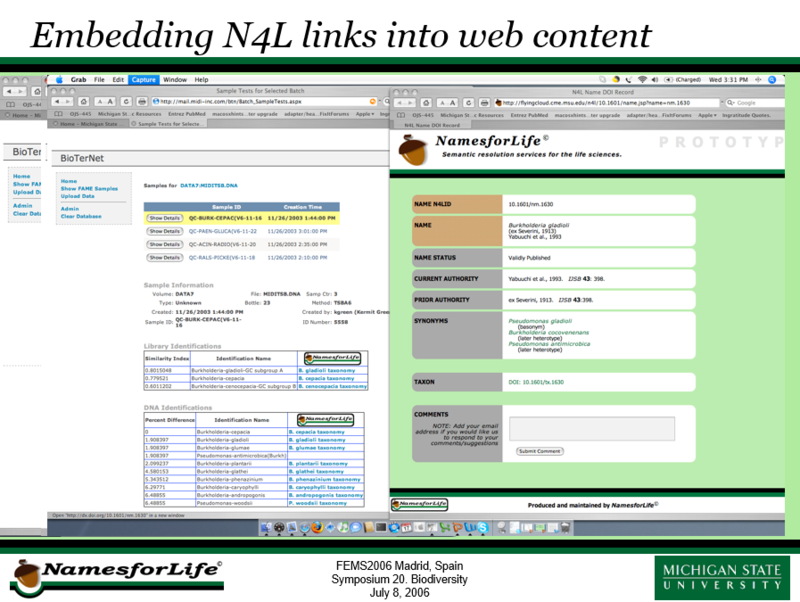 N4L persistent identifiers may be embedded into web content to enable access to taxonomic services, knowledge and rich content for names, concepts and objects. George Garrity presents “Knowledge bleed, PhenBank, and NamesforLife” during Symposium 20 (Biodiversity). There are different scopes of knowledge. There are those things that we know that we clearly understand. There are also those things that are totally unknown to us. Research helps to increase our fundamental knowledge, pushing back the boundaries of our ignorance and creating a third category of knowledge, those things that we do not yet know, but which we know we do not know them. It is our opinion that within the knowledge gradient, there exists another type of unknown - representing knowledge that was once known, but has been forgotten or lost over time. We call this the “unknown knowns”. At first glance, this might seem an implausible, but it represents a very real risk, not only in biodiversity studies, but in most fields, with the biosciences being the among the most prone to this problem, because of the extraordinary growth in many of the sub-disciplines, and the accompanying way of reporting results. A principle source of this knowledge loss arises in the very terminology we use to discuss and report our findings. Unless each worker clearly understands the underlying concepts that are used to describe their work in reference to that of others, discovery and retrieval of important findings becomes more difficult, if not impossible. Part of the problem lies in the sheer volume of material that is appearing in “print”. The second involves the rapidly evolving terms that are used to describe biologically relevant concepts at the various levels. [permalink] Posted July 8, 2006.